Figure skater Elizabet Tursynbaeva (Элизабет Турсынбаева), who represents Kazakhstan, was born in Moscow, Russia, on Feb 14, 2000. Last edited by matmuh; 04-08-2017 at 04:51 AM. Last edited by matmuh; 09-16-2015 at 09:36 AM. Yes, I also expected her to do well, but I overestimated a couple others & put them ahead of her this time...but that's ok, sometimes it's nice to be proven wrong about someone! She trained with Eteri Tutberidze's group up until she was 13, so she has had the best of two worlds when it comes to coaches. I also like her style. She seems incredibly sophisticated for her age. I like her. And I like it when Orser papa looks so proud. Cute. She has improved her expression a lot. Count me in as a fan as well. I don't follow juniors much, so I hadn't seen Elizabet before JW. However, her performances there won me over instantly. I understood why so many people were excited to see her. I love her musicality, and the innovation of her Biellmann. Wonderful taste in costumes too. If she doesn't suffer any growth/puberty issues this summer, I think she could be ready for seniors. 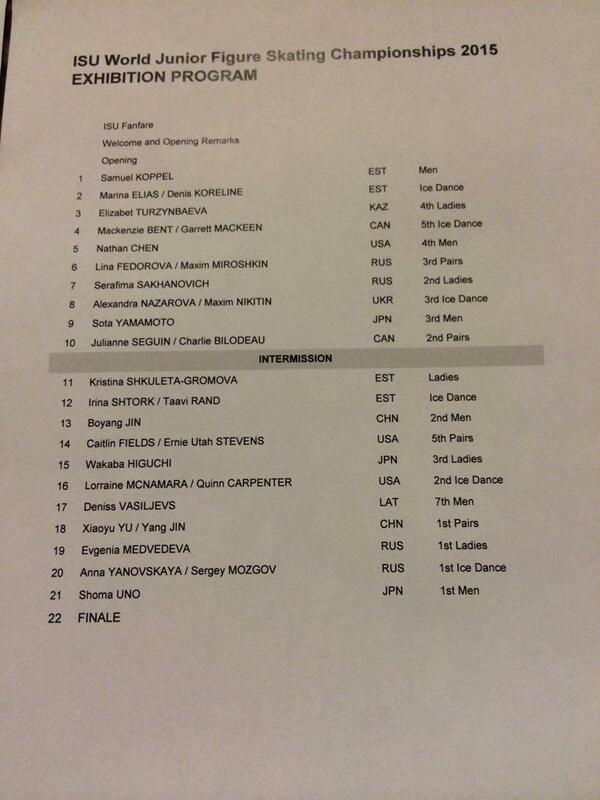 (But if Evgenia and Sima both go senior, I think she has a great chance to medal at JGPF/JW next year. Maybe she should stay for that). CBC commentary like her (probably their second fav of junior world, first been wakababy), kurt used the world "natural" to describe her skating style. really appreciate her jump landing. the way how she unfold her jump landing into her program. I wish some fans recorded it. I came here to start this thread and found someone had already beaten me to it! I discovered her after Junior Worlds last year. Last year her programs were a little... well, I actually kind of liked the very contemporary long, but the techno Evita was a little painful. I find this year, she had much better better programs/packaging. (Were her programs last year completed before the move to Orser?) Her costumes!! She might have the best overall costumes of any singles lady this year, IMO. Both so nice. And her programs were great. Orser/his team seem to have gotten her to slow down and stretch out her movements more. Overall she shows a lot of expressiveness. I think she's just fabulous. Wishing the best for her in the future. If she improves as much next year on the artistic side as she did this year, I think she can end up a force to be reckoned with. Now I understand why so many people were excited to see her skate. She is incredibly mature for her age: musicality, style, body movement and costume (some seniors don't even have as sophisticated taste in costume as she does). And seeing Brian looking so proud, nurturing and supportive of his students always make me happy. Thanks for posting! She has such grace and flow on the ice, and chutzpah to skate to Yuna's version of "Send in the Clowns"! Look forward to following her career progress. this girl skated to Yuna's SITC beautifully, tears tears I will start to follow her closely now. I like her change of mood in her step sequence in this SP, such potential. also her LP flashes of arms, and breathe really reminds me of Yuna, at the time I have no idea about this girl. She definitely reminds Yuna even without Sondheim's beautiful Send In The Clowns. Her movements are so relaxed, elegant and very musical despite her young age. I love her spins, and her jumps have good height for her size. Also, her dresses are very nice (esp. SP). In addition, like Yuna, she is the first lady skater from her country on this level. Certainly, she should be followed. She has definitely caught my eye in her past JGP outings this year! I do hope Brian continues to work with her jumps. Not that I don't like them, but her takeoffs and her arm movements makes me kinda worried.... She did greatly improve on them when comparing from her last year (ex. shoulder hunching during jumps last season) but still, more work please! yes, I notice that wild arm swing as well, then I found that her previous coach is Eteri... it explained everything. I hope training with Team BO and Yuzuru etc. will help her get better jumping technique and survive puberty. - How did she end up hiring Orser as a coach? - Is she also of Korean descent, like Denis Ten? - Are the family living with her while she trains in Toronto? She did beautifully this weekend, and jumping from 11th last year to being just outside the podium is a massive improvement. The in-and-out of the lyrics in the FS was odd, but she interpreted it beautifully. She's young and will hopefully develop, but whether or not she's the next Yuna or the next Elena G is yet to be seen. Still, she's got a great, supportive team behind her and the community of skaters around her. This should all help her develop into a fully realized person with common sense and a good outlook on life.